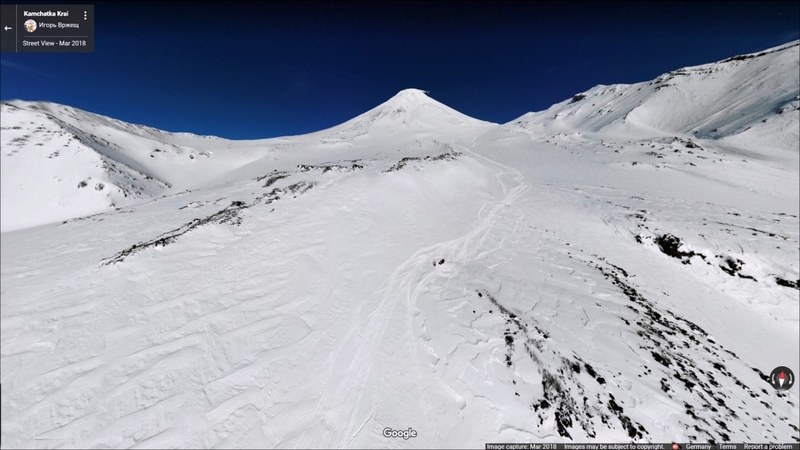 Although I have known that the Avachinsky is one of the more active volcanoes in Kamchatka, somehow I habitually tended to skip it when checking webcams and reports for new activity in Kamchatka – I saw forever this owl face, this snow-covered, never-changing mountain… That has changed since I came across this wonderful diary by a 19th century German-Baltic geologist and explorer, K. v. Ditmar. He had lived and worked 1851-55 in Petropavlovsk, at the foot of two magnificent volcanoes. Although he didn’t manage to get to the crater – bad weather, strong gas emissions and superstitious company made him abandon two attempts – he loved volcanoes! 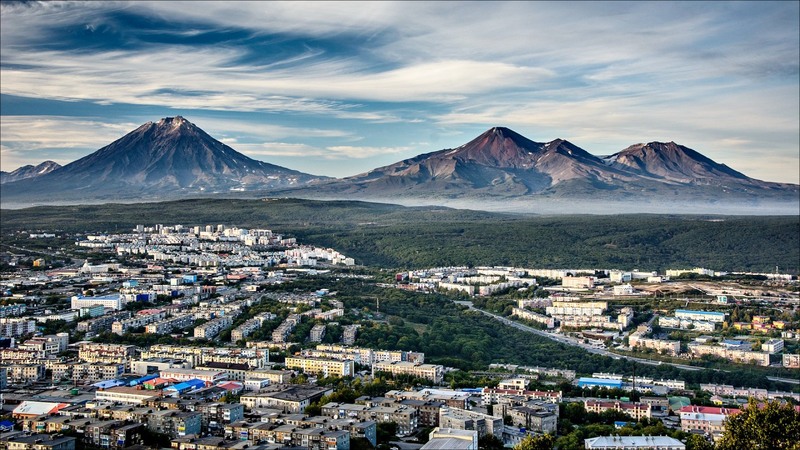 On picture postcards both Avachinsky and Koryaksky stratovolcanoes seem to tower directly over the city of Petropavlovsk. Yet they reside 22 km NE and 26 km N of the city resp., and their summits are separated by 12 km. 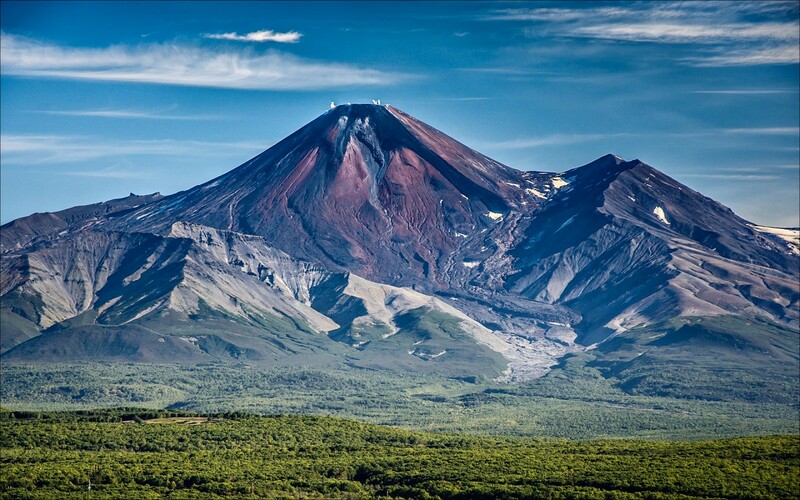 They are part of the Avachinskaya volcano group, a NW-SE-trending chain of stratovolcanoes north of Petropavlovsk. Seen from the city, 3456-m-high Koryaksky volcano is on the left, 2741-m-high Avachinsky at the right center, and 2189 m parasitic Kozhel or Kozelsky volcano at the extreme right. 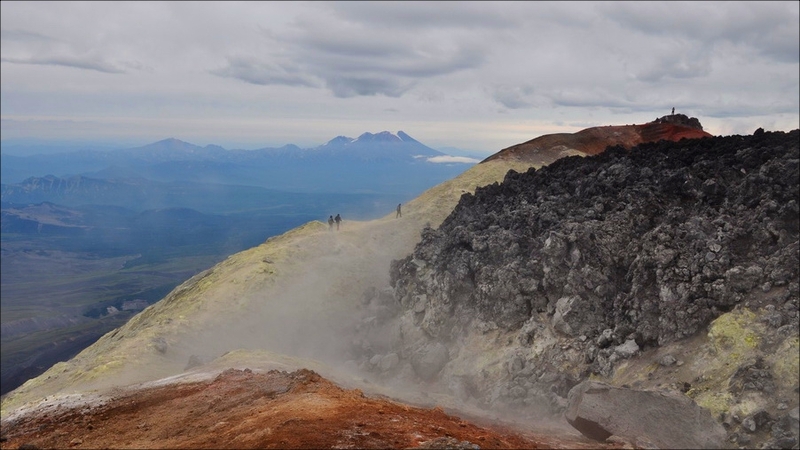 Koryaksky has had only a few minor eruptions during historical time while Avachinsky is one of Kamchatka’s most active volcanoes. Their glacier-covered slopes are dissected by steep erosion valleys, except for the smoother, active Young Cone in the center of Avachinsky. As Ditmar says in his book, the whole area around Avacha Bay bears witness to the powerful forces that have caused the greatest upheavals. Outcrops of massive lava flows of different compositions, great masses of debris tumbled down from the volcanoes, huge boulders, high cliffs and deep ravines characterize the landscape. Everywhere, hot springs and fumaroles tell of the still ongoing volcanic activity. 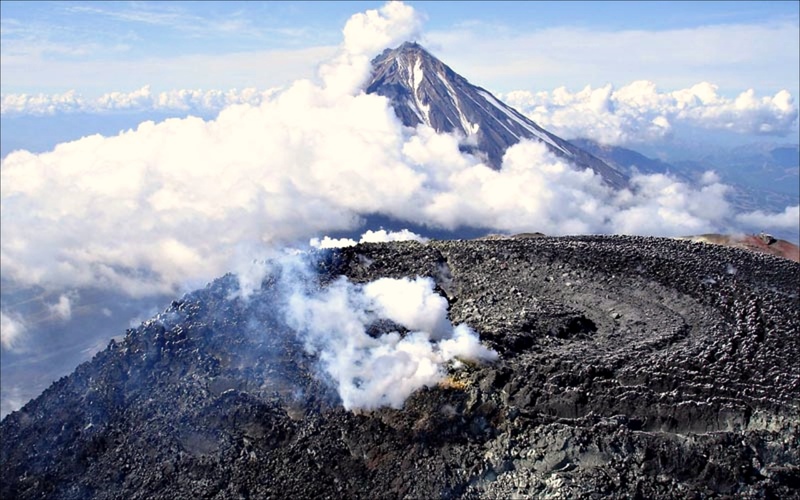 On the tectonics of this area please see agimarc’s post Tectonics of the Kamchatka Peninsula from 03/2015. The building stages of the present volcano follow one of the general patterns: the first eruptions created an ancestral volcano. Later, during the Pleistocene, the formation of a large horseshoe-shaped caldera and its inner graben destroyed this old volcano. Following this sector collapse, lava domes, and eventually the present Avachi (or Young) cone, were built up inside the caldera, making it a so-called Somma volcano like Vesuvius. The top of Avachi is where the presently active crater has squeezed out an enormous cow pad of a lava dome again. The rim of the old caldera is breached to the SW, resulting from a major debris avalanche about 30k-40k years ago. It has buried an area of about 500 km² to the south – this is the ground on which today the city of Petropavlovsk is built. 36 holocene eruptions before historical records have been scientifically determined by tephrochronology or radiocarbon dating, beginning at 6100 BCE. At this time the eruptive center was probably formed by coalesced extrusive domes nested in the collapse crater (similar to modern Young Shiveluch). Nine of those eruptions were quite large, with VEIs of 4 and 5. They were strong and catastrophic explosive events of plinian and sub-plinian types: massive tephra outputs, extended pyroclastic flows (up to 15-17 km long) and “scorching clouds” over 20 km destroyed everything in their path as well as powerful lahars up to 35 km length. Andesitic pumice varieties made up the main constituent of the erupted materials. Tephra deposits have been found of currently 10-15 m thickness in 8 km distance from the crater. 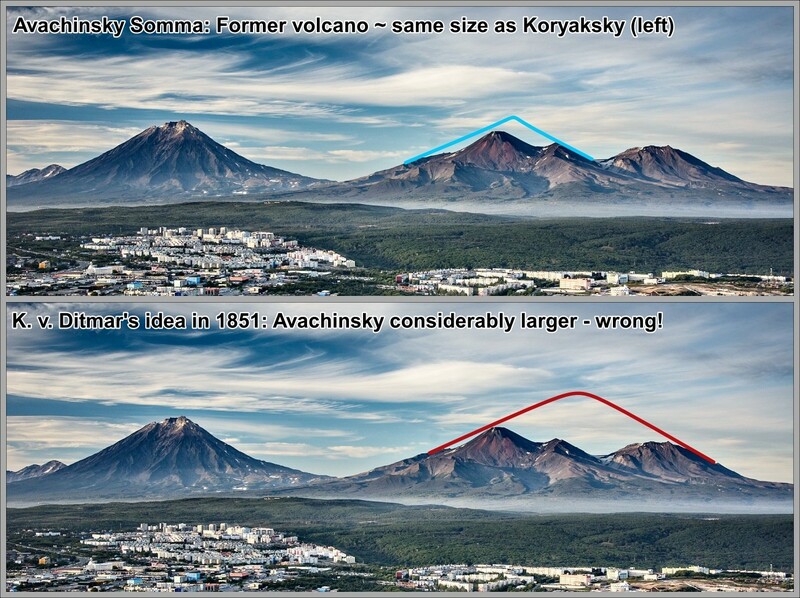 Dramatic changes in the activity of Avachinsky occurred about 4000 years ago, when lava of a more basic, andesitic-basaltic composition began to surface. At this time the Young Cone began to form; eruptions became more frequent and weaker. 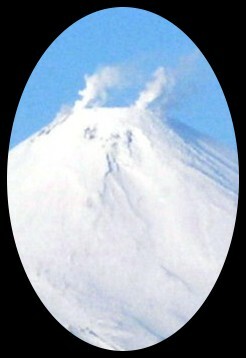 In general, the volcanic danger from Avachinsky decreased in comparison with the previous “andesitic” stage. 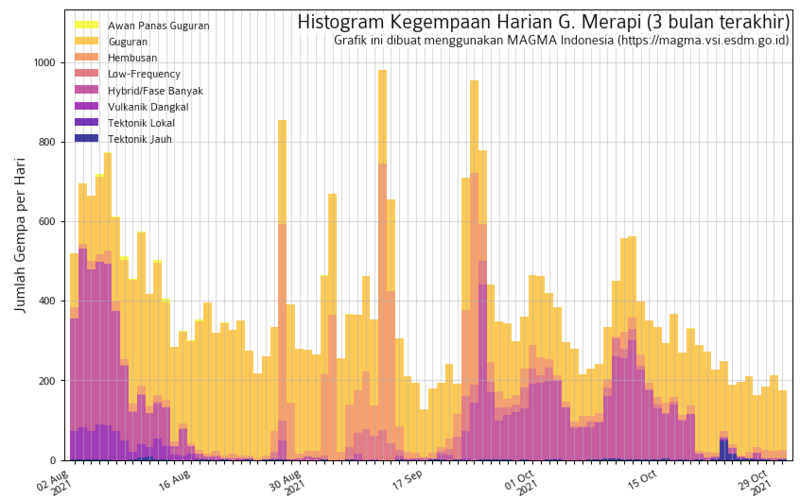 From 1737 on, 19 more (more or less severe) eruptions have been witnessed and recorded by people. A noteworthy (VEI=4) explosive event occurred at Avachinsky in 1945. This created a steep walled crater with a diameter of 330 m and 260 m deep. 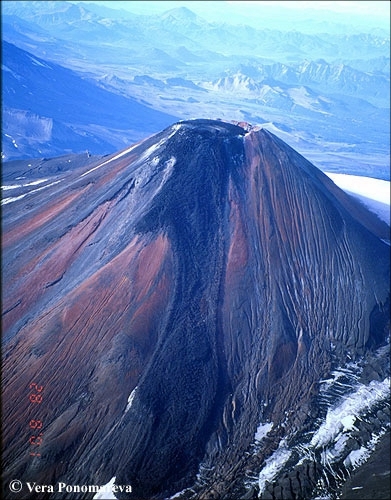 As a result of the weak eruption in 1991, this deep crater in the cone completely filled up to the brim, and overflowing, with lava. The hardened plug now forms the “cow pad” of a lava dome, with countless fumaroles around its edge. This eruption also produced lava flows and mudflows. The last confirmed eruption – just a minor ash emission – was in 2001. 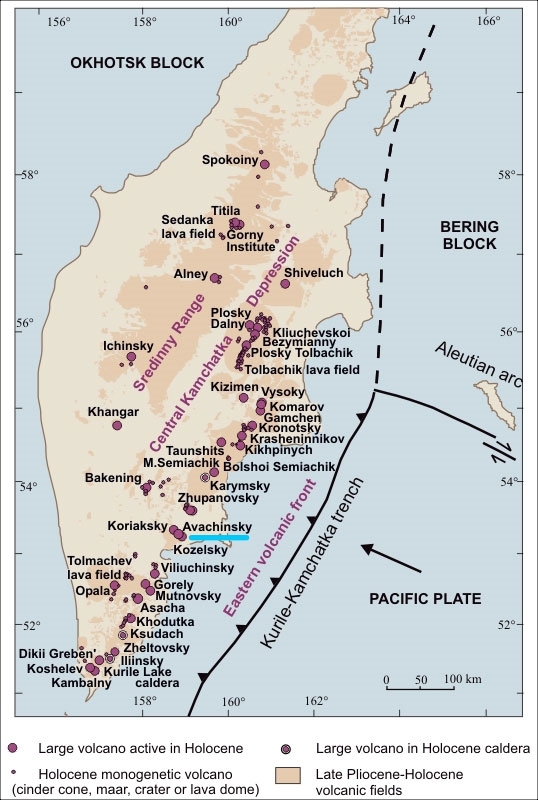 The last we heard from Avachinsky was on 10 May 2008: that the Tokyo VAAC reported an eruption plume from Avachinsky which rose to an altitude of 4.3 km a.s.l. However, KVERT did not detect ash on satellite imagery nor by direct observation. As with many far eastern volcanoes, knowledge of their existence and activities came to the western world by those travellers who didn’t actually look for them. They were generally hunting for riches in unexplored realms and trying to find the shortest routes to get them home. Captain Cook, Vitius Bering, Karl von Ditmar are just a few names of those who reported about volcanoes. Bering and part of his crew were lost and actually died on an island off Kamchatka, I think they’ve seen a lot of erupting volcanoes on the main land before they eventually starved to death. Karl von Ditmar (1822-1892) was a Baltic-German geologist and explorer of Kamchatka in 1851-55. He, as an exception, was very interested in volcanoes. For example, he had been convinced that the smaller, parasitic stratovolcano Kozhel, on the SE flank of Avachinsky, must have been a part of the ancient volcano (so much so that he never gets tired in emphasizing it with every mention). Taking it to be the eastern flank of the somma, and extending the flank line upwards to meet another line from the westernmost flank he would get a triangle depicting a huge volcano, much higher than neighboring Koryaksky and even larger than Klyuchevsky! (which of course is not the case). *I am sure it was not the small event of 1828 but that of 1827, which was a VEI=4 eruption. That must have been terrible indeed for the population when Petropavlovsk was already an important port town. Von Ditmar made two attempts on climbing Avachinsky. On the first, he didn’t get far when the weather became threatening. On the second, it was a great day and he and his companions went up to the foot of the Young cone. Here his two men balked. There was no way to get them go one step further up. So he went on his own, climbing up straight over rough debris and then on slippery smooth lava surface. Just before he reached the crater the sulfur smell became unbearable and he had to turn back without having seen what he so badly had wanted to see. Currently, the volcano is in a stage of reduced eruptive intensity, which began in 1945. 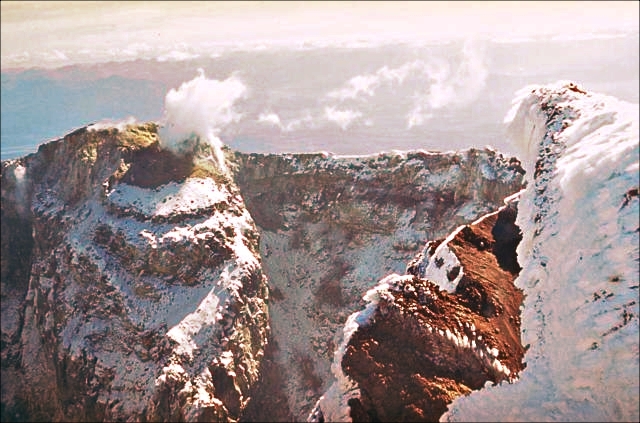 However, its enormous rigid plug in the crater now poses the danger of a more explosive eruption next time round. Scientists expect it to turn out similar to the 1737 and 1827 eruptions, which were VEI=3 and VEI=4 resp.. The explosivity will depend on repose time and magma supply. The longer the time, the stronger becomes the plug. The more magma presses against it from below, the stronger the eruption will be. Also, changes in the volatile components of the magma can play a role, as well as several other factors. In any case, collapses and directed explosions associated with them are possible, which are caused by the present obstruction of the vent. HOW DANGEROUS IS LIFE FOR THE PETROPAVLOVIANS ? The answer is: It could be alright, you know, but you never know, and you’d better err on the cautious side. 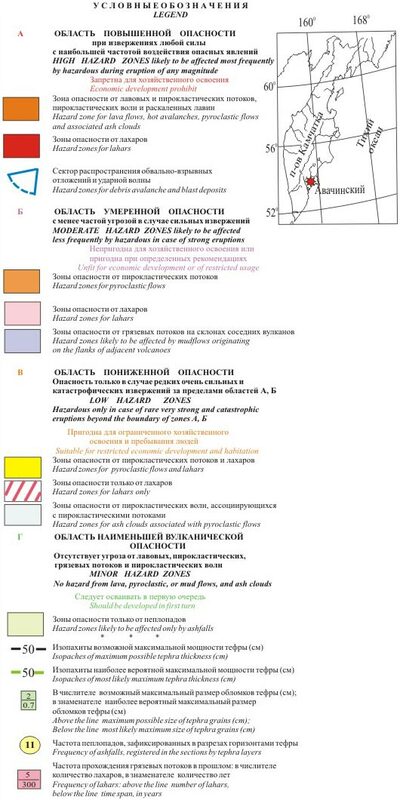 An assessment paper by Bazanova et al. from 2001 finds the following: The activities of the Young Cone have remained quite the same for most of its 4000-year life, and there is no reason to believe that significant changes will occur in the next 200-300 years. Unless – there is an unforeseen, fundamental restructuring of the volcano’s power system as a result of some catastrophic events. After the initial ~500 years of particularly catastrophic explosive “birth pains”, the eruptions ranged between severe and weak explosive to effusive events up to date. 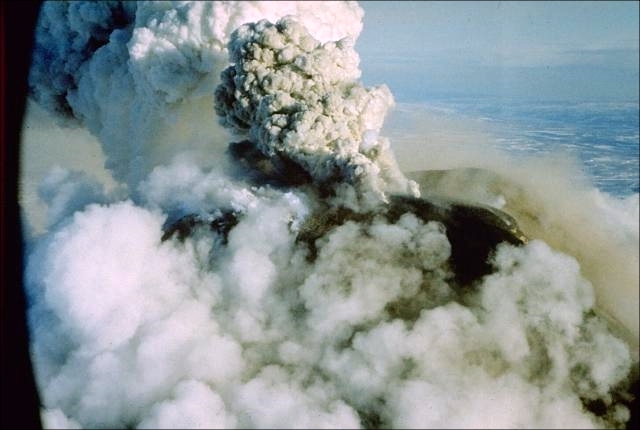 Over the past 3,500 years, there have been at least 26 strong eruptions, among them at least 5 eruptions of the type of 1945 (with a tephra volume of about 0.25-0.5 km³). But yes, even moderate eruptions can affect the city of Petropavlovsk. There is not too much to fear from lava flows and hot ash-and-block avalanches – they are usually limited to the cone of the volcano, only occasionally going down to its foot in the upper reaches of the dry river valleys. 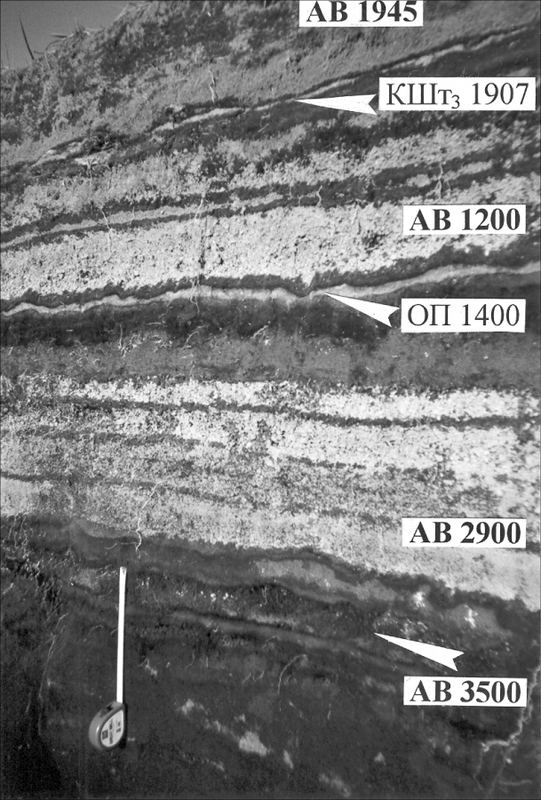 Fortunately, investigations of historical ash layers show that the city is located in what appears to be a dead angle, or lee side, between the main directions of ash dispersal. That means it is not in a position to take the brunt of ash falls. Quite another story are pyroclastic flows and especially lahars. 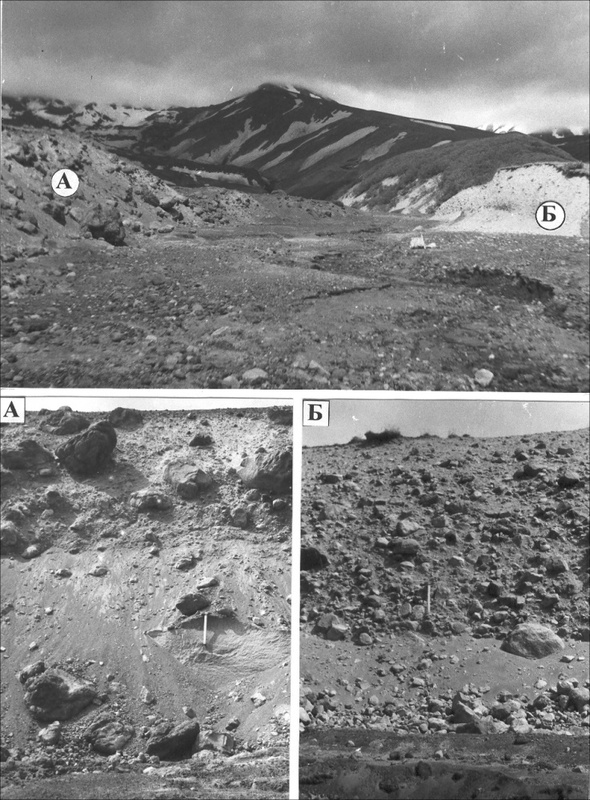 PFs have been found to reach up to 20 km from the crater in the past, while lahars repeatedly descended 30 km or more along the dry river valleys. 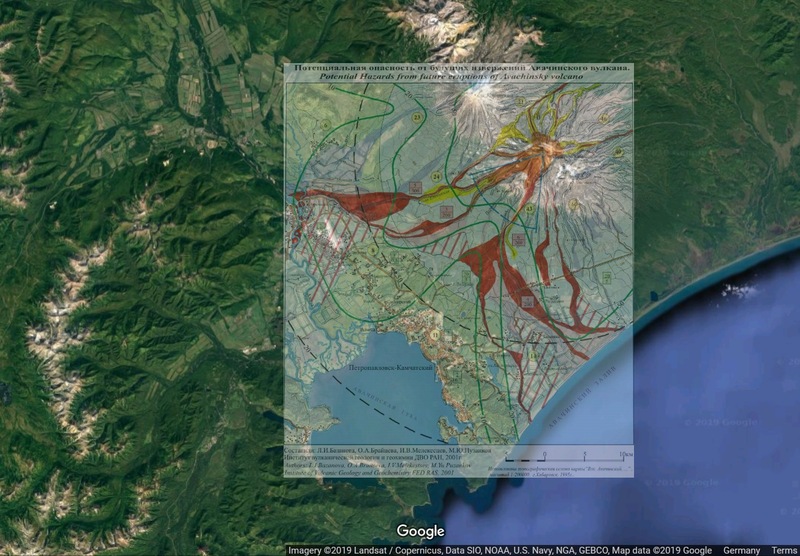 Lahars represent a significant threat in the future, during eruptions of almost all types. Hazard map for Avachinsky laid over GMaps image. 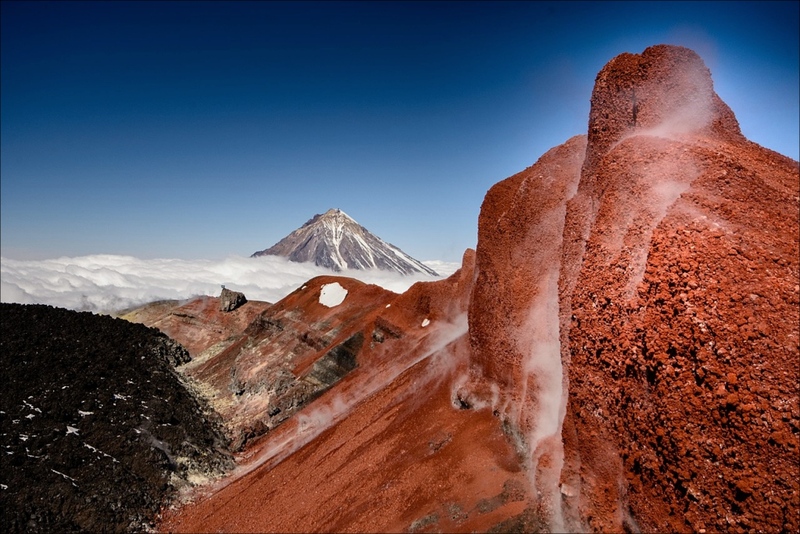 Now this set me thinking… magma injection “within the entire Eastern Volcanic Zone” of Kamchatka? Is that what could happen – or is it a prank of Google translate? Good that the Yellow Press hasn’t seen that yet! For me it has cut out my homework: finding out why and how and if at all such an event would be in the cards. Any idea where to start? Please let me know. thanks for the link on Mayotte. Just to point out 2 mooc courses on volcanology. one on Coursera on seismology and one on Edx on volcano monitoring. The first one is a bit math/python oriented (but very interesting), the second one seems for the moment much more accessible and is speaking of Icelandic volcanoes. Both can be followed for free, but you’ll need to pay to get a certificate. Thanks, dfm, yes I had heard but forgotten about the Edx course; so I have enrolled today and completed the first module. I was amazed to see the lecturers: it reads like the Who is Who of Icelandic volcanologists. I won’t buy a certificate, though. Are you doing the Coursera one?